Ever wonder what soup mix was? Or how to use it? Turns out it's the express route to a quick dinner. 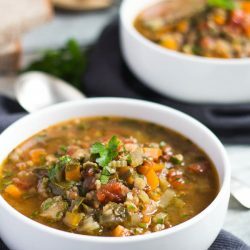 Throw soup mix into the slow cooker to create this thick and hearty slow cooker vegetable soup. Turn the slow cooker to low to allow it to warm whilst gathering your ingredients. Saute the onion in olive oil in a small fry pan until lightly browned. Place the browned onion and garlic into the slow cooker. Add the stock, carrot, celery, chopped tomatoes, soup mix, and oregano to the slow cooker. Stir the chopped spinach or silverbeet, and the parsley, through the soup. *The olive oil is only used if you are frying your onions and garlic. Omit it from the recipe if adding the onions directly to the slow cooker. A ratio of 1 cup soup mix: 6 cups stock will produce a thick, hearty soup. Add less soup mix if you want a thinner soup. If short on time, skip browning the onions and garlic. All the ingredients can be prepared the night before, and just placed in the slow cooker in the morning. The soup will thicken on standing. Simply add a little extra water or stock when reheating to thin the soup. Freeze leftovers in meal sized portions.